This publication is provided as a popular guide to Alabama hunting and sport fishing laws and regulations. The Code of Alabama and the Wildlife & Freshwater Fisheries Regulation Book are the final authorities on laws and regulations relating to hunting and fishing and can be accessed online at outdooralabama.com/hunting/seasons-and-bag-limits. Contact the Wildlife & Freshwater Fisheries Division, District Wildlife & Freshwater Fisheries Offices or any Conservation Enforcement Officer if you have a legal question not adequately covered in this booklet. 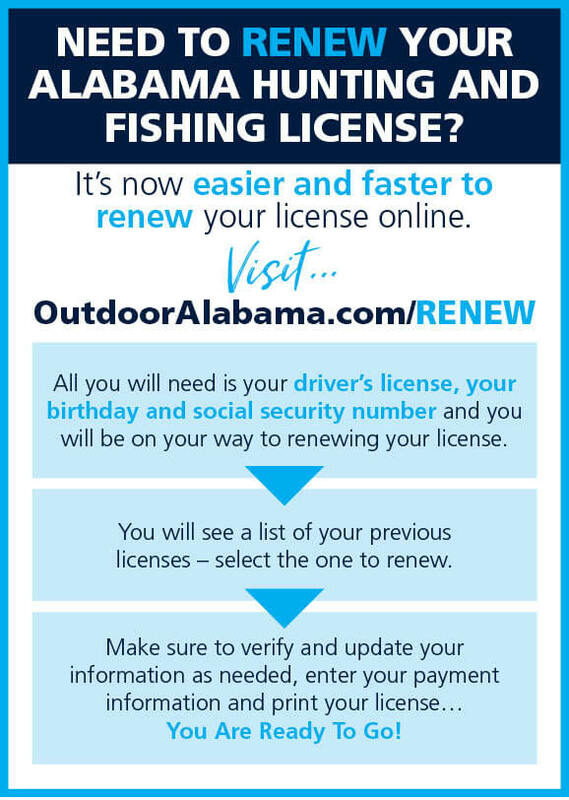 To qualify for a resident hunting or fishing license, a person must be a bona fide resident of Alabama for a minimum of 90 days continuously immediately prior to purchasing any such license or be a member of U.S. military stationed in Alabama. For the purpose of buying hunting and fishing licenses, residency is determined by the Driver’s License issuance. Resident and nonresident annual hunting and fishing licenses are valid from September 1 through August 31 each year. Successfully completing an approved hunter education course is mandatory for all hunting license buyers born on or after August 1, 1977, see Hunting Laws, Regulations, & Information for exemptions. Licenses must be in possession while hunting or fishing. A deer and turkey harvest record (either paper or app form) must be in possession every time a person is hunting deer or turkey. It is unlawful to utilize or possess more than one harvest record. It is illegal to kill or cripple any species of game bird, game animal or game fish without making a reasonable effort to retrieve same and include it in the daily bag or creel limit, except all game fish not meeting legal length regulations, and protected species. An individual should not trail or retrieve game on property they do not have permission to enter. All game bags, hunting coats, camping equipment, live boxes, automobiles and such used in hunting and fishing will be open for inspection by officers of the Department of Conservation and Natural Resources. Alabama hunting and fishing licenses are available in all sections of the State from approximately 275 special license agents in many sporting goods stores, marinas, and at all county courthouses. Licenses may also be purchased by mailing completed applications, proper payment and copy of driver’s license to Attn: License Sales, Wildlife & Freshwater Fisheries Division, 64 N. Union St., Suite 567, Montgomery, AL 36104. For application packet call (334) 242-3465 or e-mail dcnr.wfflicense@dcnr.alabama.gov or visit our website at www.outdooralabama.com/license-information. It is illegal to willfully or knowingly make a false statement to a license agent when purchasing a license. It is also illegal to lend, borrow, sell, buy, rent or use another person’s license to hunt, fish or trap. For the purpose of buying hunting and fishing licenses, residency is determined by the Driver’s License issuance. An Alabama resident without an Alabama driver’s license must present proof of residency to a probate judge or license commissioner to purchase a license. (Excludes all persons with out-of-state driver’s license). Renewing your Hunting and Fishing License has never been easier. Visit www.outdooralabama.com/renew. All licensed hunters who hunt doves, woodcock, rails, snipe, coots, ducks, or geese in Alabama are required by Federal law to obtain a Harvest Information Program (HIP) permit prior to hunting. The HIP program provides improved data collection on these species. This will allow hunting seasons for the various species to be set in an objective and efficient manner while maintaining healthy populations. HIP permits are free and are available wherever hunting licenses are sold. It takes a very short time to provide the requested information. In exchange for completing the HIP survey, you will receive proof of certification which must be in your possession while hunting migratory birds. Hunting Licenses: Required for residents 16 years of age and under 65 years of age and nonresidents 16 years of age and older. Residents on active military duty home on leave may hunt and fish without licenses. (State and federal duck stamps are still required when hunting migratory waterfowl. Management Area License and Permit are required when hunting deer or turkey on a wildlife management area.) See Hunter Education on Hunting Laws, Regulations, & Information. Residency is determined by Driver’s License State of Issuance. 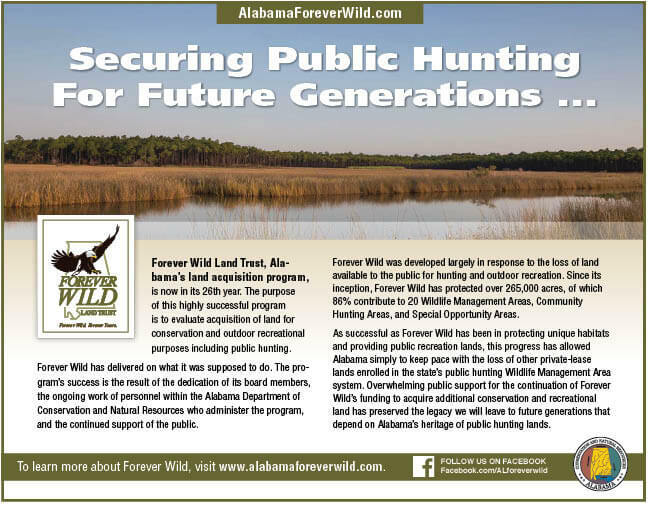 Licenses are available by calling the toll-free number 1-888-848-6887 and online at www.outdooralabama.com.